Are you looking for the most powerful, cheapest or technical SEO software? Be careful, just because your direct competitor subscribes to all the services does not mean that you should behave in the same way. 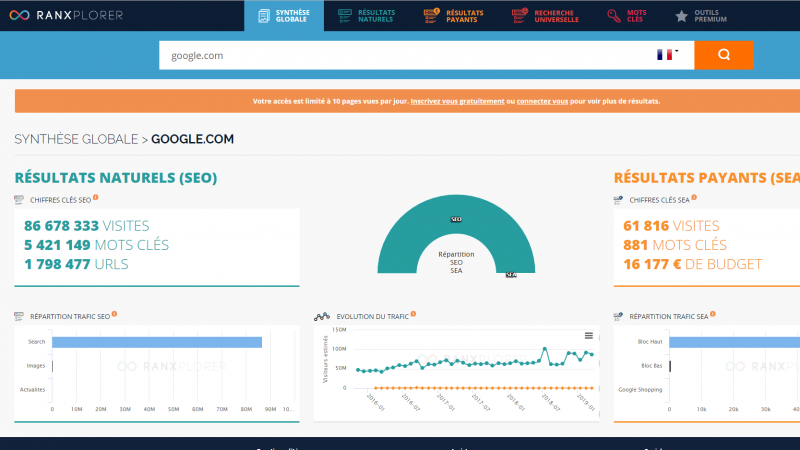 By choosing your SEO monitoring, analysis and optimization solution carefully, you should be able to reduce the final score and satisfy all your SEO needs quite easily if you follow our guide. SEO software in SaaS has become the standard and can be used on both Windows and Mac, or even mobile phones, quite easily and provided you have a good Internet connection. For this reason, publishers quickly relied on this format, such as Semrush, which began its career as a position and keyword monitoring site. Semrush is indeed one of the most complete tools currently on the market, culminating in an international domain name analyzer. All you have to do is enter a url and an ultra-complete report will appear, showing the number of keywords in the database for the site, variations in position, direct competitors, estimated traffic, actual "extrapolated" traffic, click value...In addition to this, the software has been enhanced with very advanced audit features: url crawl in number, error reports, content and optimization suggestions, competitive follow-up... A list that grows longer every month as the solution grows at a frenetic pace. Of course, not everything is useful, but the user can configure his projects as he wishes and make them evolve according to his needs. He will also be able to receive reports by email at the desired rate and export data within the limits of his subscription. 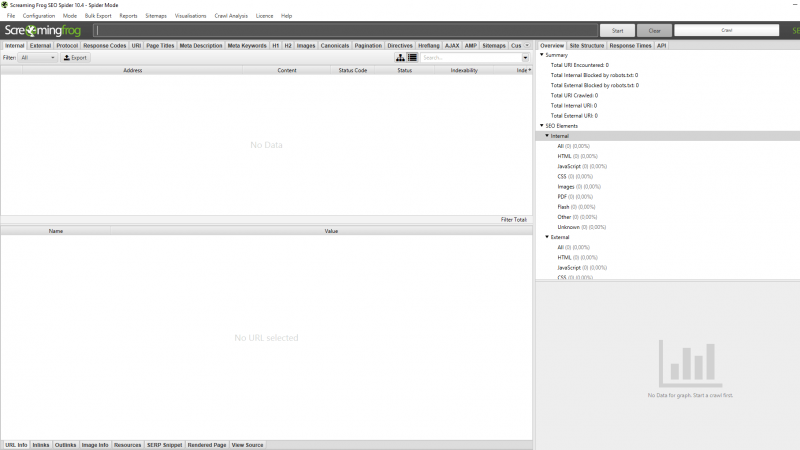 Ranxplorer it offers a much more stripped down and more "web" interface. This French software focuses on its core business and abandons functionalities that are too remote. As a result, the keyword database is more accurate, in our opinion, but is not refreshed over the same period. If the displayed data seems to correspond more to reality, the software is less intuitive and the relevance of the results displayed first has to be modulated. That said, the list of functionalities far exceeds that of traditional tools: "Ranxplorer", competitive analysis - (and graphical), SERP comparator, display of cached search pages, tracking keywords... The list is too long to mention here but for a referrer there is enough to fill his days. 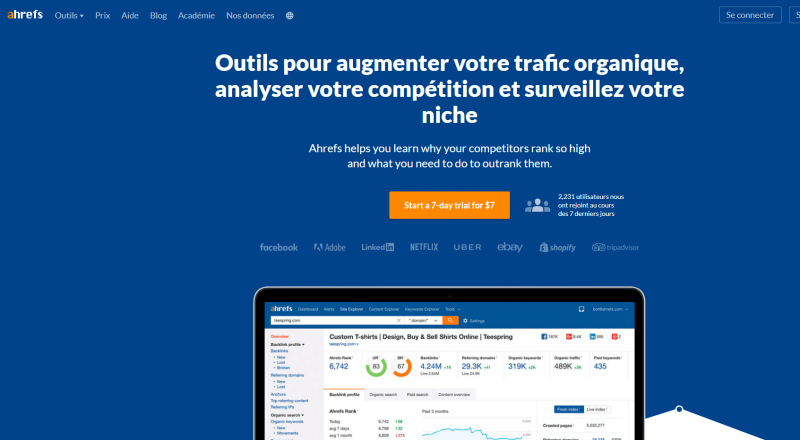 Ahrefs is intended to be Semrush's direct competitor and, in fact, takes over all its functionalities. It is not possible to say who first had the idea of adding this or that option, as the interfaces concentrate the same elements: Estimating visits, ranking the site, keyword base, positions, internal or external linking, high value pages, growth potential... Many of the elements present should remind you of things. The agencies make no mistake about it and choose one or the other of these solutions by recommending them with the same enthusiasm. 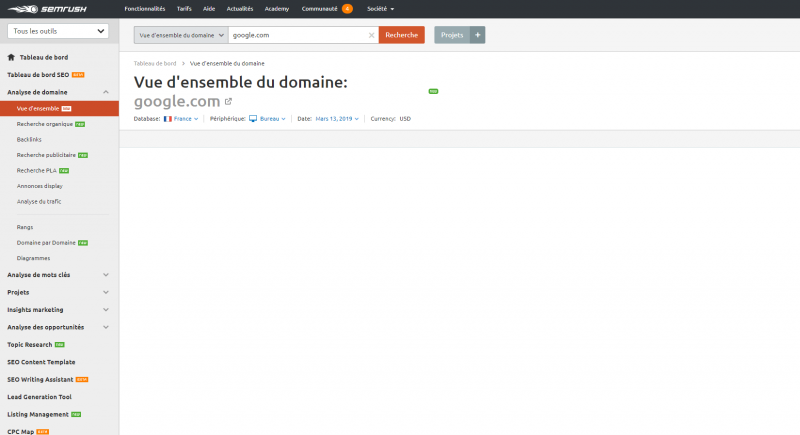 SEObserver is also French, Cocorico, and concentrates several tools in a single interface. Intended for SEO Rock Stars who like to save time and who don't like to scatter, Seobserver is characterized by a follow up of the site by line. The different parts of the software focus on the fluctuations of the SERP and the followed keywords (the SERP Machine), the follow-up of the SEO actions according to different parameters (backlinks, technology...) and thus the observation of the performances of a precise method and the selection of keywords. The software is highly praised and for good reason, its creator is very influential on social networks and in professional events, many users do not hesitate to share good practices and good results after using the tool. A software that therefore offers an almost live view of the evolution of its site, but which is intended above all for professionals in the sector. Moz Pro is in English. It is the only and only language and perhaps the biggest flaw of this online software that combines several features. Moz's field of action is therefore relatively wide, from link auditing to SEO on Page recommendations, position tracking, keyword suggestions... And a link verification module inherited from the past, which has been at the heart of the tool for a very long time. The latter is always efficient and active, and always gives a qualitative rating to the site it analyses. The established link profiles provide information on quality and quantity, but also the value they bring to the site in question. The icing on the cake, the "MozCast" gives day after day a weather report on variations in Google's keyword database, allowing to detect disruptions...or algo updates. Authoritas is not a mere competitor of the above-mentioned software. It is also a unique application dedicated to both SEA and SEO campaigns. Data is at the heart of the system and your different components can easily be inserted into the tool so that you can analyze, through complete reports, trends, visits, successes but also points to improve. A very complete and complex tool, designed for structures capable of exploiting its potential. For specific needs and to avoid ever-increasing subscriptions, you or your agency may need a tool that targets a specific issue. Majestic SEO has only one field of action, but it is essential, since it is only interested in links. By highlighting two rating systems, TrustFlow and CitationFlow, the tool offers a fairly objective overview of the sites offered for analysis. By frontally indicating the quality (TF) and volume (CF) of links a site receives, Majestic has established itself as a model and has succeeded in bringing these notions into common vocabulary. To obtain these results, the tool has a growing and up-to-date backlinks database, to which is added a whole set of elements such as the freshness index, classification by site type, status, etc., as well as adapted tools, including the issuing of complete reports and the monitoring of competing or exemplary sites. 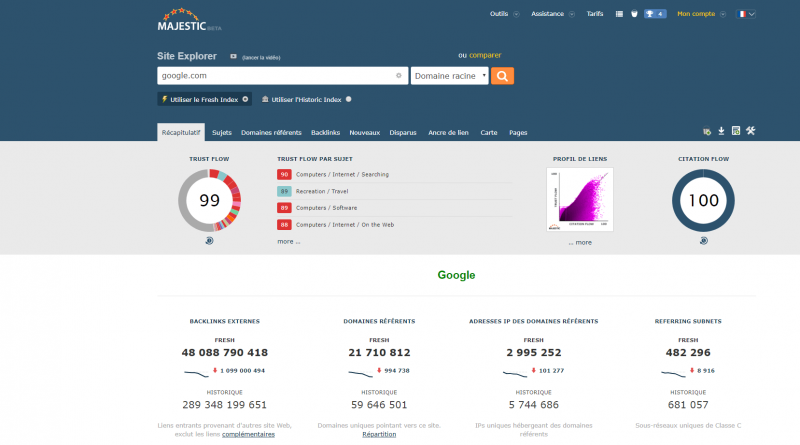 Majestic SEO is also a set of features and insight to plan a link campaign, or to know how to position yourself in the landscape in terms of popularity. Screaming Frog SEO Frog is not an online tool, but it is essential to perform a thorough audit of its pages. This customizable crawler works either by url or by submitting a list of pages to be tested. The bot (reported under the agent of its choice) will pass over all declared and crawlable pages, which will be analyzed in real time by the software which will create a complete file, indicating url, their status, tagging, redirections and possible problems. It doesn't stop there, since the tool also provides crawl previews, a dynamic map of the internet mesh and many other things. Be careful to configure the software beforehand crawl, small sites do not behave like big ones, it will be necessary to think about excluding urls, modify the RAM load, the number of threads... Indispensable. OnCrawl could well have been placed in the full suites, but as its name suggests, its main function is to crawl the pages of a site, and more particularly the analysis of logs. In summary, the software will crawl the pages of a site and produce a complete report, before drawing conclusions for overall improvement or providing advice on different factors. The analysis becomes more granular at the page level, with an observation and ways of improvement and above all many factors to be observed and which have a daily impact on the sites, such as the display speed or the duplicated content. The log analyzer is just as notable: A simple file can provide as much information on the passage of bots, the status of pages and the path taken as a visual analysis performed by a developer. 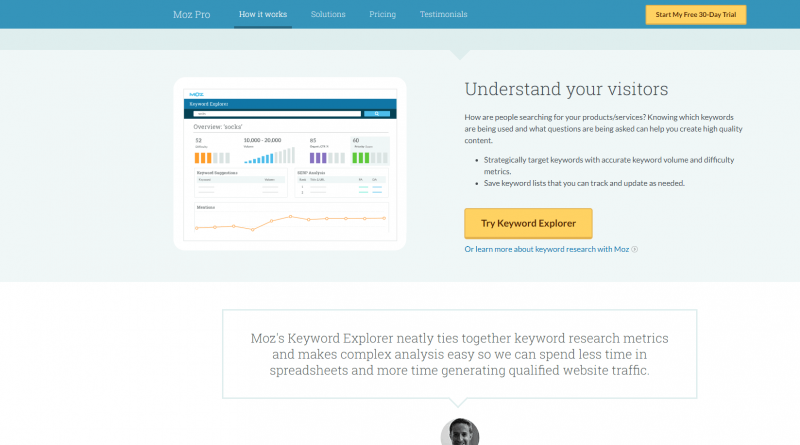 This indispensable tool is one of OnCrawl's strengths today, and it continues to build on it. Botify is to be stored right next to OnCrawl. Same functionalities, same tools, but a focus on log analysis that makes it a reference in the field, this online tool is very appreciated for its calculation capabilities. 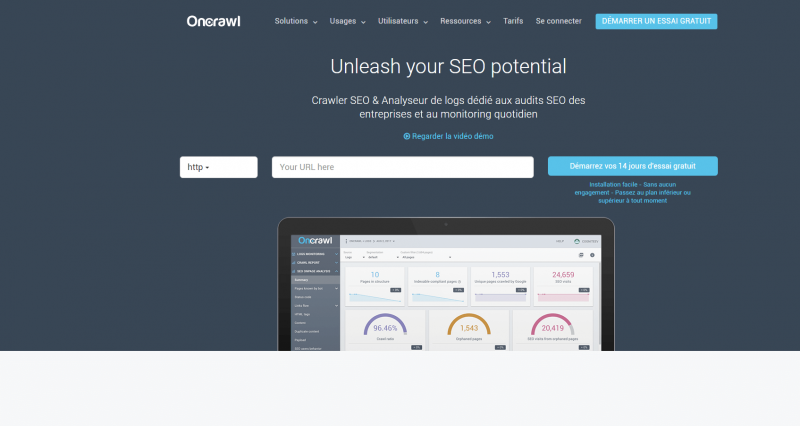 If optimizing crawl's budget is your goal, you will have enough to satisfy your needs, although the software is primarily intended for experienced professionals. In the list of features, we find a keyword analyzer, a page tester (audit of different factors such as loading time...), internal mesh verification, hreflang test... 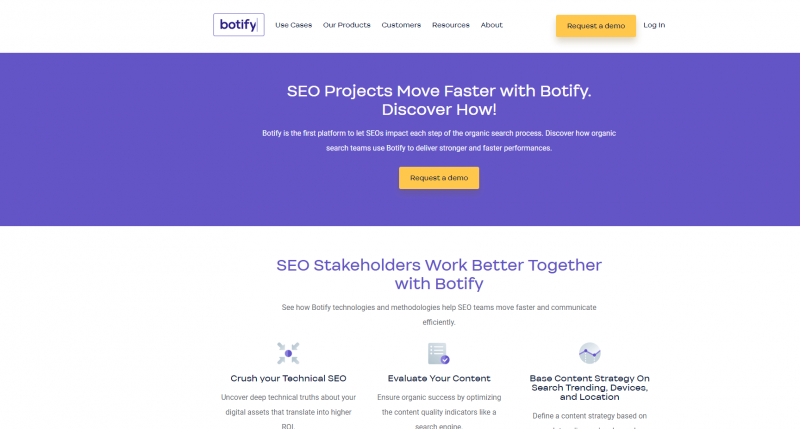 The list is long but for the moment Botify is developing around the crawler and an ultra-complete unified solution should arrive sooner or later. 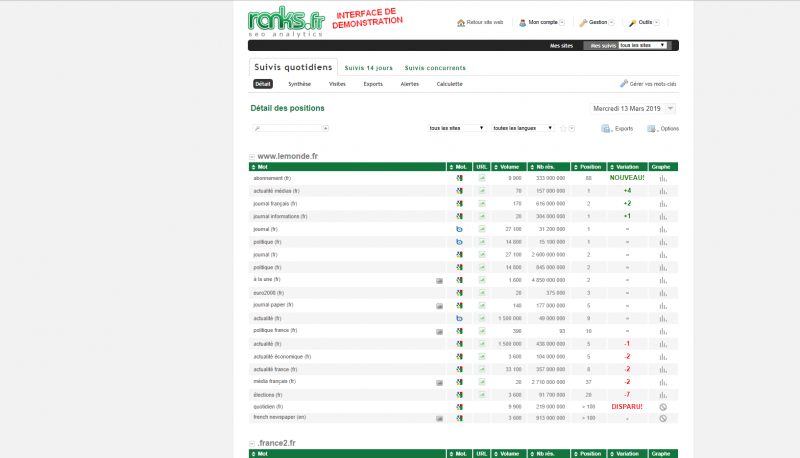 Ranks works as follows: You provide him with a list of keywords, a domain and a daily position report is established according to the database of the search engine and the agent of your choice. This way, you know what words you and your competitors are positioning yourself on because the observation of this information is shared. In addition to this feature, the Serpometer gives a trend of variations in Google's search pages, just to know if today it is stormy or calm flat in the SERP. 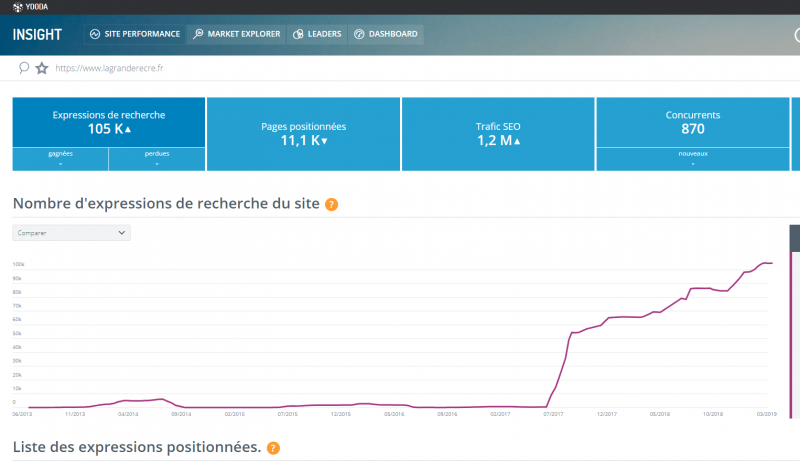 Yooda Insight is considered as one of the most accurate keyword position monitoring tools for the data reported by Search Console but focuses only on France. The tool is very easy to use and the few sorting and tabs available allow you to quickly get answers to your questions (positioning of a keyword, competition, estimated traffic, number of results...) if they do not go out of scope. The list of pages that appear is also accompanied by a list of associated expressions, allowing you to retrieve a whole set of keywords to work on. To be used on competing sites therefore. It should be noted that Yooda SeeuRank is still active, but is not available in SaaS mode.